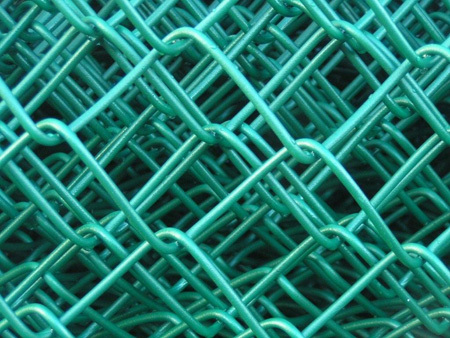 Chain-link (also referred to as wire netting, wire-mesh fence, chain-wire fence, cyclone fence, hurricane fence, or diamond-mesh fence) is a type of woven fence usually made from galvanized or Polyester powder-coated steel wire. The wires run vertically and are bent into a zig-zag pattern so that each "zig" hooks with the wire immediately on one side and each "zag" with the wire immediately on the other. This forms the characteristic diamond pattern seen in this type of fence. Chainlink is stocked at our Erith branch. All rolls come complete with enough linewire to attach the link to chainlink posts. Available in PPC RAL6005, RAL9005 or Galvanised.